Derek McLeod watched a flaming car on I-93 south, near the Ink Block in the South End around 11:20 p.m. He reports Boston firefighters showed up quickly to douse the flames. Read more. State Police report the man who died when hit by an SUV Wednesday morning was Claudio Correia, 26, of Boston. State Police say they continue to investigate the incident, in which they say Correia made it across the southbound side of I-93 before getting hit on the northbound side just past Columbia Road. WBZ reports MassDOT workers spent the night checking out light poles along I-93 in Dorchester to try to avoid a repeat of a Thursday morning incident in which a pole crumpled to the ground - where a bus then hit part of it, sending it flying into the front of a car. The driver was not hurt. 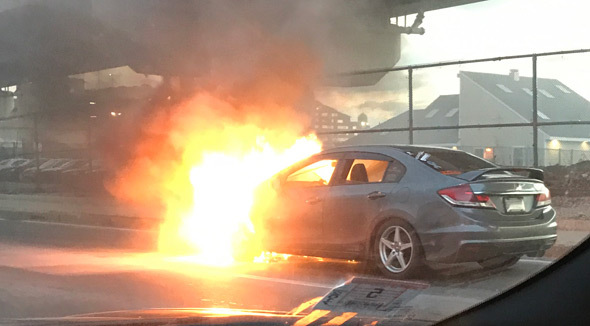 Roving UHub photographer Mike Pineau passed by this Honda flambe on Frontage Road off the Expressway around 6:50 a.m., a few seconds before Boston firefighters pulled up. 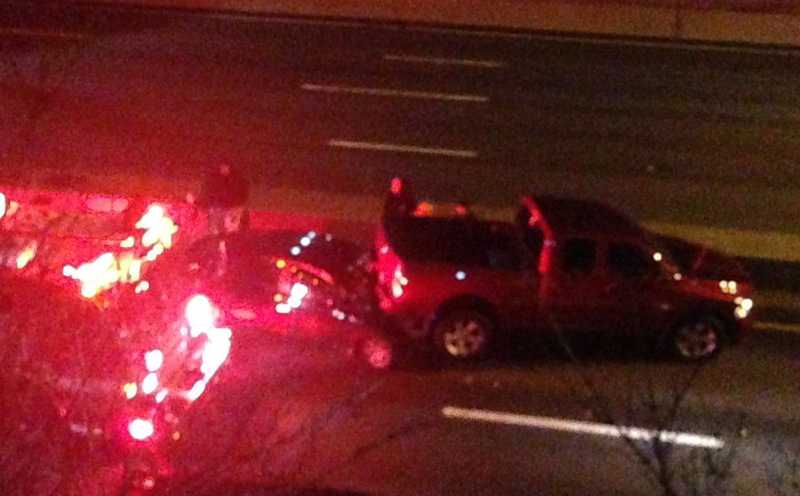 Paul Nutting photographed an early morning crash on I-93 in Savin Hill. 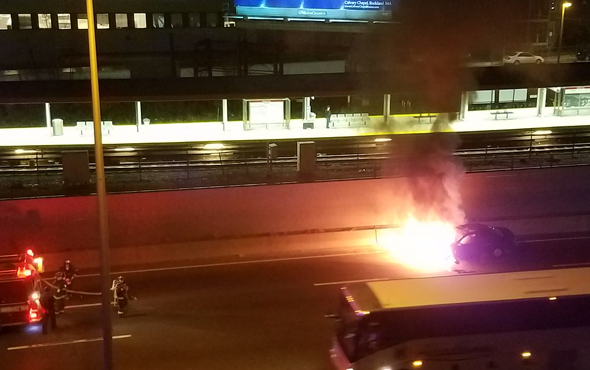 Aaron Honsaker had a good view of a car in flames on I-93 southbound near the Savin Hill T stop around 11:15 p.m. He says it looked like the car hit the barrier first. Volvo flies off 93, lands on car on Morrissey; one dead, one injured. State Police report that around 12:40 a.m., a Volvo S60 sailed off I-93 near the Morrissey Boulevard exit, landing on a Honda HR-V on Morrissey Boulevard. The driver of the Volvo, a Chatham man, 50, was pronounced dead at the scene. The driver of the Honda, a 21-year-old woman from Dorchester, was taken to Boston Medical Center and is expected to survive, State Police say. State Police say investigators are trying to determine how and why the Volvo went airborne. 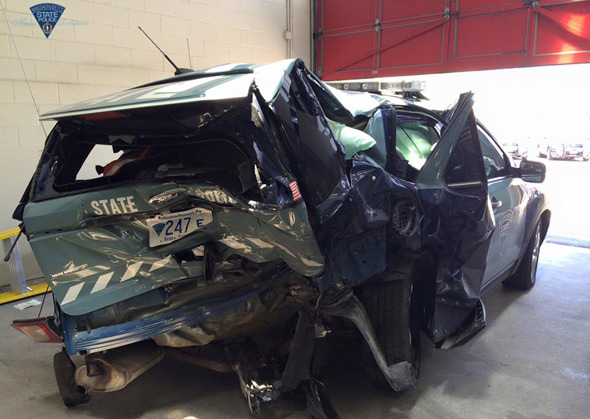 A Quincy woman faces OUI charges for a crash that sent a state trooper to the hospital early this morning, State Police report. Read more. WHDH reports a crash around 2:45 a.m. on I-93 southbound near South Bay sent six people to the hospital, including a state trooper who was stopped by the side of the road dealing with another crash when a car slammed into his patrol car. 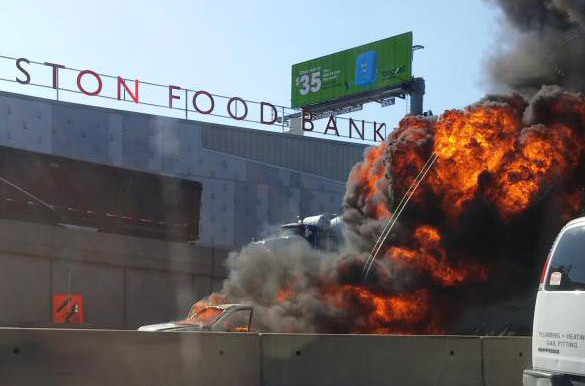 Nate Morrow captured a self-immolating car on I-93 south, just past the tunnel, around 4:15 p.m.
Caroline Cook watched the car burn from the Whole Foods parking lot: Read more. The Globe reports on Caitlin Clavette, who died this morning when a 200-lb. manhole cover came flying into her car in the O'Neill Tunnel just before the Expressway. The remains of the car on the Expressway. Photo by Ben. State Police report a manhole on the southbound side of the O'Neill Tunnel became dislodged and went airborne - flying right into the windshield of a car and killing the driver. Read more. 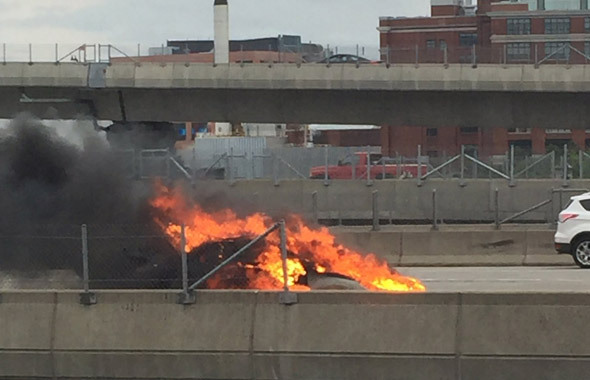 Jarvis passed by this ball of fire on the Expressway shortly after 3 p.m.
Jamie Walsh also saw the flames: Read more. A rollover shortly before 10 p.m. near the Neponset exit southbound brought ambulances racing to the scene and quickly backed traffic up to Chinatown. State Police reported at 10:11 p.m. that only one lane southbound was open - and that the left lane northbound was shut. Some cops make arrest while others block protesters in Dewey Sq. Photo by Conqy. A Ferguson protest in Dudley Square turned into a march of people that kept getting thwarted by Boston and State Police to shut one of the highways running through Boston. 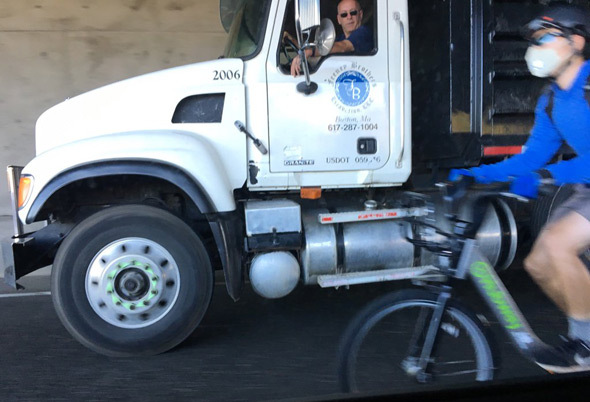 The action started at the Southeast Expressway southbound at the Mass. Ave. connector, where protesters were mostly blocked - although they shut down the connector, police kept them off the Expressway. State Police report a water-main break has flooded I-93 south and that traffic is being diverted at Mass. Ave. The problem is three feet of water near South Bay. This is what the Expressway looks like when everybody has to get off at Mass. Ave.
Belden photgraphed the beginnings of a brush fire along the Neponset River in Dorchester, around 2:20 p.m. At 3, she reported exits 11B and 11A on the Expressway were closed, since the fire's now right under the bridge.